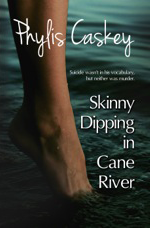 My novel Skinny Dipping in Cane River is out! Check out Amazon for a paper back or Kindle! I will never sell, exchange, or otherwise disclose your information to third parties for financial or personal gain. Your email address will be added to my list on an email newsletter service and only myself and my web developers will have access to that information for the purpose of sending out informational emails.